Forcibly recruited into MI6 after the mysterious death of his guardian, fourteen-year-old Alex Rider is sent to infiltrate the organization of sinister billionaire Darrius Sayle. 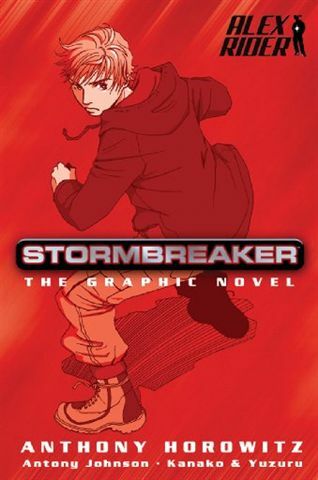 The official graphic novel adaption of 2006's hottest movie blockbuster, Stormbreaker. Alex's Uncle works for the 'bank'. Well, that's what he tells his nephew. Little does Alex know, he actually works for MI6 and every day when he leaves for work, he's most-likely jetting off to another country to track people down and have a car chase....maybe he'll even kill someone if he has to. This massive secret is found out though, when eventually Alex's Uncle dies on one of his missions. At the funeral, Alex is approached by someone and that's when the story really starts to happen. The drawings in this book are really cool. Sometimes the scene has no need for words, as the picture alone is expressive enough. They're really impressive! I think this graphic novel gets a 5/5. I can't see anything wrong with this at all - great for a beginner or a short-story for a more experienced reader. Wow, it sounds great! Thank you for the review. I love your new header, too! PS. Hooray, more than 100 followers - well done! Also love the new header!